It's estimated that more than 2.3 million people have MS worldwide, and about Arkansans 3,000 have it. MS is a chronic, unpredictable disease that targets the nervous system. Today, medical researchers are making progress toward finding a cure. Just 30 years ago, there were no treatments for MS, while today, even though there is still no cure, there have been breakthroughs in research. There's a new drug that could possibly put someone into remission for good. However, this is a daily battle of silent symptoms you can't even tell someone has. Channel 7's Stacey Spivey sat down with four women with MS and their doctor, who has changed the way MS is treated in the Natural State. Four women met at a restaurant in central Arkansas. All are in different walks of life, and some are even strangers, but they all have one thing in common. "Welcome to the club," Marla Murphy said. 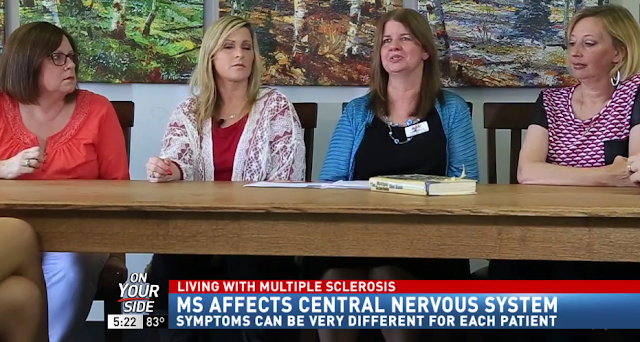 All four women, Murphy, Susan Spivey, Julie Cawthron, and Debbie Broadway, have multiple sclerosis. It's disease affecting the central nervous system with no cure. It's a battle every day, in which each patient suffers from different symptoms and different relapses and remissions. Patients experience symptoms that range from loss of eyesight and pain, to fatigue and numbness. And as you can see in the video above, they all look completely normal. "I went to the eye doctor, thinking I just needed glasses. I mean I literally could not see out of my left eye and he said, 'have you ever heard of MS'," Murphy said. "One morning, I woke up and I thought both of my legs were asleep. They were tingly and they stayed that way for nine months," Cawthron said. "I woke up one morning and I was numb from the hip down," Spivey said. It also hits close to home for me, as one of those women is my mom, Susan. "I was literally having to pick my leg up to put it in my pants every morning to get dressed," Spivey said. She's been diagnosed for two years and it has changed everything in her life. Something as simple as going to the grocery store has become a daunting task. However, she found a glimpse of hope through Dr. Lee Archer, a neurologist at the University of Arkansas for Medical Sciences. 30 years ago, he was the first doctor to specialize in MS Arkansas. It was a time when there were no treatments. Now there are 12 types of medicine, but there's still so much unknown about MS; from what triggers it, to even a true diagnosis. "If you see one person with MS, you've seen one person MS," Dr. Archer said. "Because it's so variable." They are usually able to diagnose patients after an MRI shows there are lesions on the brain. That's why all four women we sat down with have different symptoms and treatments. Broadway has been living with MS for 27 years. When she was first diagnosed, the only treatment from her doctor was sleep, rest, and to stay out of the heat. Friends had also given her a cookbook as a guide. "From this [her original treatment], to having three other options. and they're growing and growing by leaps and bounds..that's my rescue for what I'm afraid," Broadway said. Cawthron has had MS for 20 years. "I had no idea what impact it had and wasn't sure if I could have a job and provide for my child. It was a terrifying experience," Cawthron said. She said she went into remission for a few years, then one day, everything changed. "I fell down a flight of stairs in a hotel ballroom, and that was a sobering experience for not only me, but my co-workers," Cawthron said. Murphy's 18 year battle with MS hasn't been as severe, but she uses her strength towards her work as a physical therapist. "I feel like having it, I have a better understanding of what not to do," Murphy said. All women are telling their story on World MS Day in hopes of raising awareness for more research, which Dr. Archer hopes will eventually help get completely rid of their episodes. "We have a drug that was just approved within the past year, where so far, 65 to 70 percent of people go into remission," Dr, Archer said. That new drug is a huge step for MS treatment, but it's $110,000 for the first year. There are still many unanswered questions about MS treatment and research, but there's no question these MS patients, like my mom, are strong women with strong doctors ready to face the future. "I truly think we have reason for a lot of optimism for the future of MS treatment," Dr. Archer said. In honor of World MS Day, Wednesday, May 25, country singer Clay Walker, who's living with the disease, is putting on a concert in celebration of the fight against MS at 7 p.m. at the Statehouse Convention Center. It is more likely for women and Caucasians to get MS, and even though there is no direct evidence that it is inherited, Dr. Archer said he recommends anyone who is first generation of a MS patient should take 5,000 mg of Vitamin D a day.